UK Foreign Secretary David Miliband says this is a "decisive moment" in Pakistan's history after its president declared a state of emergency. 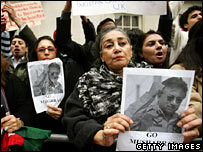 Mr Miliband called for President Musharraf to step down as planned as head of the army, release political prisoners and lift media restrictions. He echoed Downing Street's earlier call for restoration of "normal democratic and constitutional processes". Pakistan's PM has said elections will go ahead as planned in January. The Department for International Development is currently providing £236m in aid to Pakistan over a three-year period, a figure which is expected to double to £480m over the period from 2008 to 2011. The UK has said it is "considering the implications for our development and other assistance programme in Pakistan". But Mr Miliband said: "Now is not the time for threats to aid which is important to the Pakistani people." He said he had been discussing the Pakistan situation with his European counterparts and US Secretary of State Condoleezza Rice. In a news conference, he said: "Now is the time for President Musharraf to be absolutely clear that elections will go ahead on January 15 on a free and fair basis and that he will resign as head of the army." He added: "I don't want to hide at all the gravity of the situation or the importance of the situation, or the fact this is a defining moment for Pakistan and for its leadership. "And I think that the whole world will be watching to see how the transition to democracy, that is so important for our own security and stability never mind for the security and stability of Pakistan itself, is re-established." Under the emergency decree, rights have been suspended, the media restricted and opposition leaders arrested. General Musharraf imposed the state of emergency amid rising militant violence and ahead of a Supreme Court decision on whether his re-election last month while remaining army chief was valid. Mr Musharraf said he was imposing the state of emergency in order to curb extremism. But Mr Miliband added: "I think the decisions that have been taken over the last two days are not in the interests of Pakistan and are not in the interests of the fight against terrorism." Pakistan's prime minister Shaukat Aziz said on Monday parliamentary polls due to take place in January would be held as scheduled, after the government had suggested they could be delayed by up to a year. On Monday Foreign Office minister Lord Malloch Brown said both Britain and the United States had made it very clear that it would be "a huge retrograde step and damaging to stability within Pakistan" if it appeared to turn away from "elections and democratisation". The reassessment of the UK's aid package comes as MPs called for greater pressure to be put on the Pakistani leader. Liberal Democrat leadership contender Chris Huhne said Britain could be left isolated if it failed to deal firmly with General Musharraf. He told ITV's Sunday Edition: "It is a big mistake for the government not to put more pressure on General Musharraf because frankly Pakistan is going to have a new democratic regime, there is going to be a change back and we are aligning ourselves with the wrong side." If the US were to curtail its aid to Pakistan, the country would be heavily hit. The nation has received at least US$10bn from the US since it became a close ally in President George W Bush's "war on terror" in 2001.